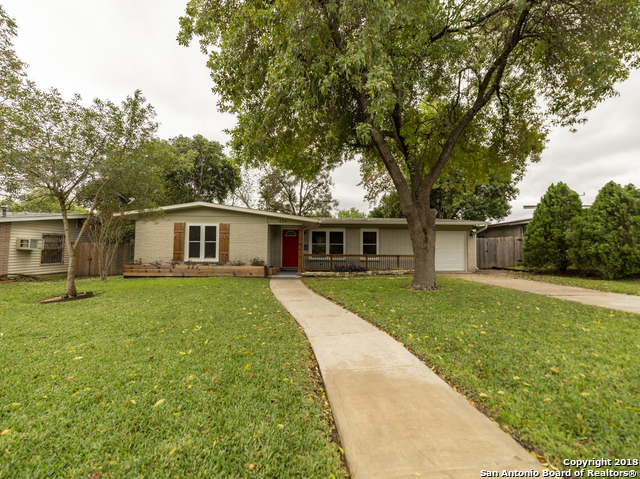 All Ridgeview homes currently listed for sale in San Antonio as of 04/24/2019 are shown below. You can change the search criteria at any time by pressing the 'Change Search' button below. "A must see 1-story, 3 bedroom, 2 bath home with the original hard wood floors. The home has been freshly painted, updates in kitchen, master bath, walk-in closet and updated light fixtures. The 3+ car garage/workshop is air conditioned with rear and front access, coupled with additional parking pads for 5 cars. 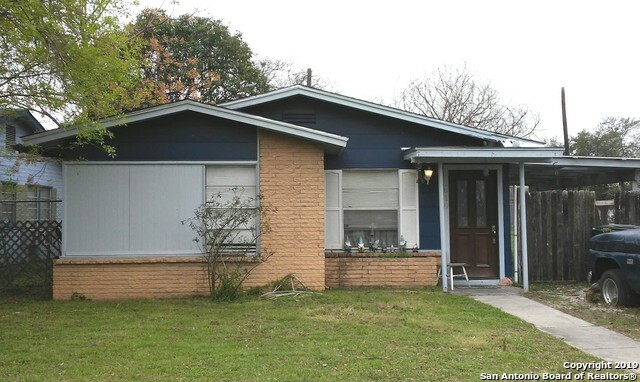 This home is centrally located with easy access to Loop 410 and US Hwy 281." "Spacious one story,4 sides brick, 3 Bedrooms, 2 Bath, office/ by master Bedroom. Wood and Ceramic tile flooring, updated kitchen with granite countertops, Updated bathrooms. Established neighborhood, close to schools and shopping areas"
"LOCATION, LOCATION, LOCATION!! Lovely home featuring wood flooring, laminate in the bedrooms, roof Nov 2018, large 2 car garage, laundry room off of the garage, 2 large living areas, cozy updated kitchen with granite countertops & new appliances. Enjoy the large deck in the back yard. Great for entertaining, grilling, etc. This is a very desirable area so don't miss this one!" "Meticulously maintained one story gem with original wood floors. 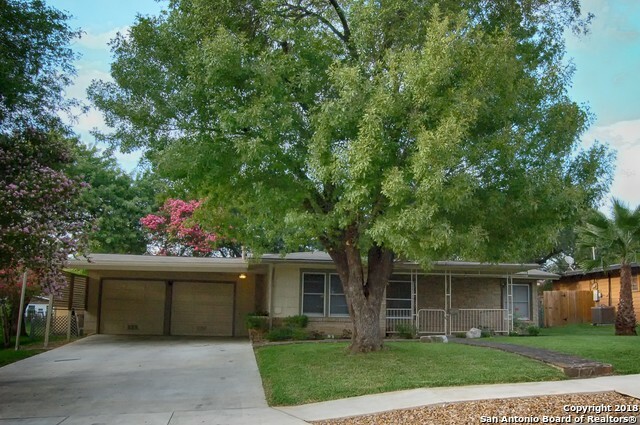 Exterior boasts 7 crepe myrtles as well as oaks and pecans. Spacious family room features lovely fireplace and gorgeous wood beams.An art deco home at it's finest! Kitchen offers gas cooking and gorgeous Italian porcelain floors. Extended covered patio makes living a breeze. Other amazing upgrades include plantation shutters and ceiling fans as well as flagstone walkway areas! Very close to North Star Mall and The Quarry Market. M"
"Great one story home, very spacious plus converted garage and expanded Master bedroom adding approx. 400 sqft to the living area. Big level back yard with alley entry and detached storage/garage. Gas heat, cooking. Partial remodel in progress. Centrally located neighborhood to shopping, entertainment, restaurants, schools, minutes to SAMCE, Randolph AFB and more! Transferable foundation warranty. Great investment potential, priced way below market! MUST SEE! HURRY! Minutes to Loop 410." "Very charming home in Ridgeview, one of the best located neighborhoods inside 410. 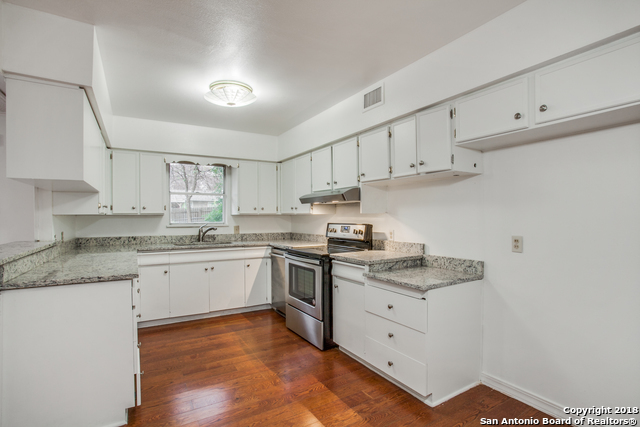 Easy access to shopping, entertainment and a short drive to Downtown SA! Kitchen is updated, freshly painted and very well maintained house. Home is sitting on 0.22 acres with mature trees all around and large backyard for entertaining! This is a MUST SEE!!" "Completely re-done in Amazing location Convenient to Quarry, NorthStar, The Pear, Fort Sam and freeways, yet quiet and peaceful. Stunning kitchen has new GRANITE COUNTERTOPS, New Cabinets. Beautifully remodeled home with an open floor plan. Many more upgrades! Very well kept with great curb appeal, mature trees and fenced back yard." "Beautifully cared for home in Ridgeview! Lots of upgrades to include kitchen cabinets, subway tile backsplash, granite counters, stainless appliances, gorgeous refinished wood floors, interior paint, updated bathrooms with tiled showers and updated vanities and updated light and plumbing fixtures! Roof & HVAC only about a year old! Large backyard has a storage shed and privacy fence! This home is clean as can be and move in ready! Get here soon, won't last long!" 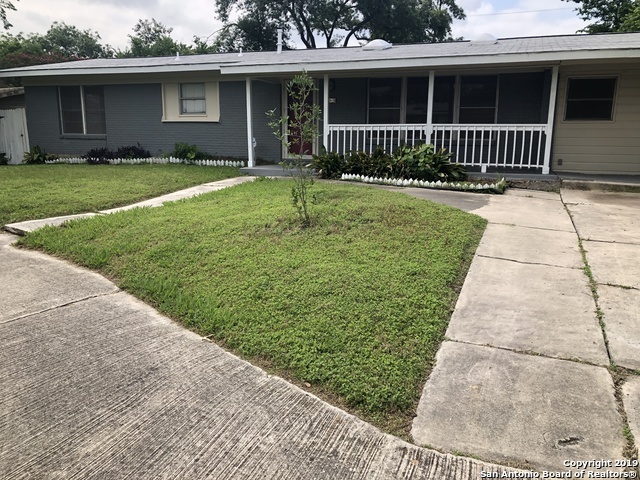 "Remodeled mid-century three bedroom one bathroom home in prime location with quick access to 281, 410, Downtown, The Quarry and The Pearl. 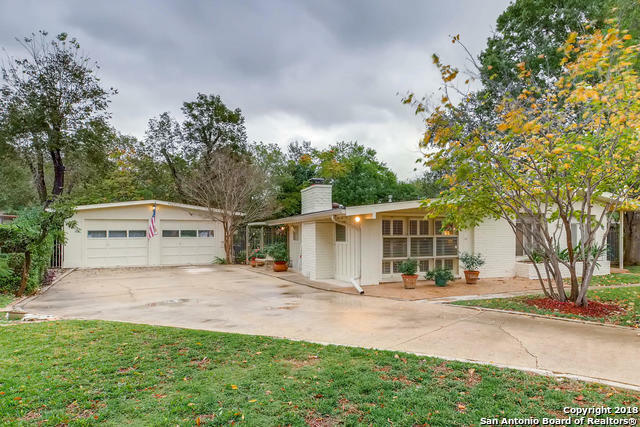 This 1955 gem has an open floor plan, original red and white oak floors with a two car garage. The kitchen has granite counter tops, updated cabinets and an island. A covered patio looks onto a generously sized backyard with a privacy fence. Roof, foundation, driveway, sewer lines, electrical and french drain all have been recently replaced or improved." "Lots of love with with this home and it's upgrades and it shows. Open floor plan! Updated flooring, cabinets, granite counter-tops, self closing drawers upgraded stove and refrigerator, upgraded tile in bathroom(s). Converted garage is also a mother in law type room with a separate entrance and exit. Many more upgrades! Large backyard with fruit trees. Located close to North Star Mall and Loop 410. Close to restaurants, shopping, schools etc. Great house in a great neighborhood." "Wonderful family home with original refinished oak floors, remodeled kitchen with granite, nice glass tiled back-splash. (2) LARGE family rooms, with three bedrooms, 2.5 baths. Roof only two years old; nice private backyard with great trees! What a value for the money!" "Quick! 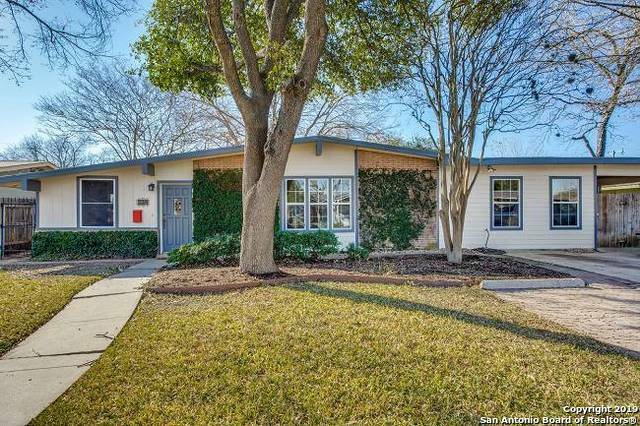 Come see this charming midcentury jewel, perfectly set in the quiet near-north central neighborhood of Ridgeview. Just minutes from Alamo Quarry and North Star Mall shopping, restaurants and services. Easy access to downtown and the airport make commuting a dream. Original hardwood floors, and updated kitchen create the feeling of a warm and welcoming home. Enjoy your expansive deck and mature trees in your breezy backyard oasis, perfect for outdoor entertaining." "Great starter home in Ridgeview! 3 bedroom/2 full bath/1 car garage single story with enclosed cover patio. This home has had a lot of love over the years but needs a new owner to come and put their own personal touches. Roof was replaced 2 years ago, windows in the front. Good bones, needs paint, flooring and new love. Estate sale soon and more details to follow." "Nice one story home conveniently located close to down town, the Airport, and much more. Pretty wood floors through out family room, hall, and bedrooms- Saltillo tile in the kitchen- Light and bright open floor plan - Two bedrooms-spacious bathroom -large backyard with room for family fun and entertaining - Washer and Dryer connections in the garage - Refrigerator conveys with the home . Clean and Move-in Ready." "Location, Location, Location! Minutes away from The Quarry, 281, 410 and the S.A. Airport. Home sits on LARGE corner lot. Back yard is flat with enough space to add square footage to home if need be. Detached storage unit could be used for workshop. CHAIN LINK FENCE encloses entire back yard. Mature trees on site. Streets are wide. Roof was recently replaced. Local schools are in the ALAMO HEIGHTS SCHOOL DISTRICT. All around this home has unlimited potential. Could be a great investment propert"